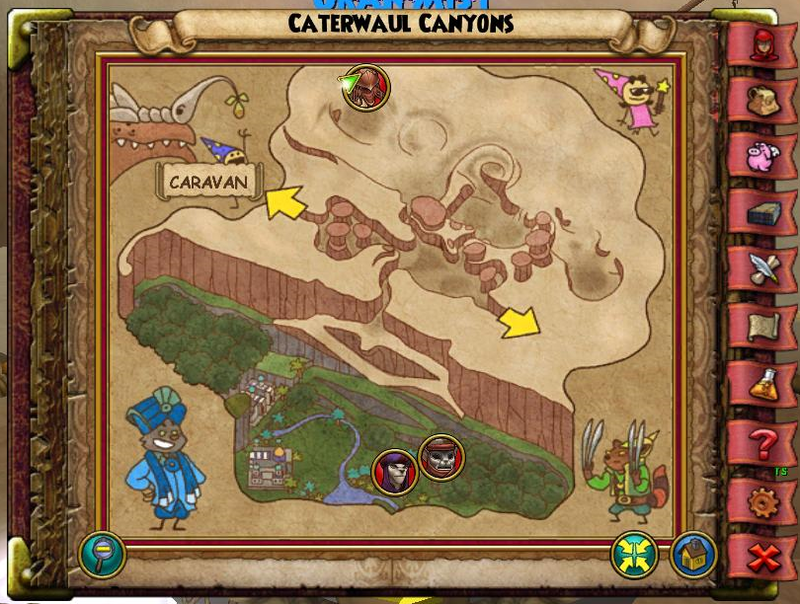 Let’s take a look at the quest called “Cavern of the Wyrm” in Caterwaul Canyons! It’s an instance with two mob fights and a cheating boss. However, you will have to solve a morse code puzzle to get the boss to appear! 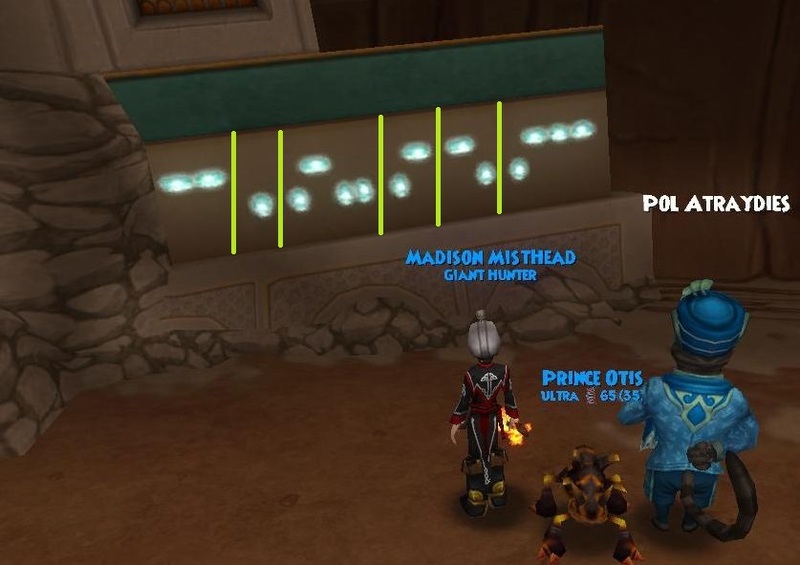 This morse code puzzle is confusing wizards all over the Spiral, so it’s time to shine a light on how it works! We’ll look at the whole instance of couse. 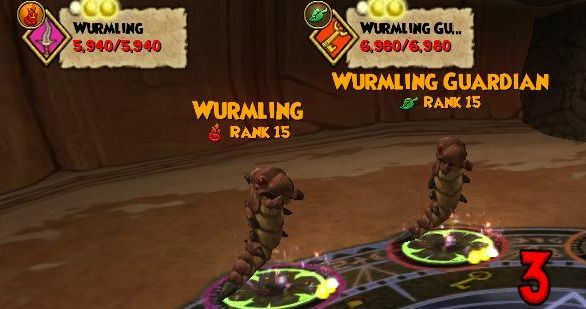 Once you enter the instance, you need to defeat a Wyrmling (Fire, 5,940hp) and a Wyrmling Guardian (Life, 6,980hp). These are just a normal mob without cheats. Before you move on to the next room, you should look at the wall. 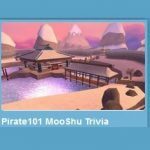 There’s a morse code written on it that you will need for the puzzle that’s coming. 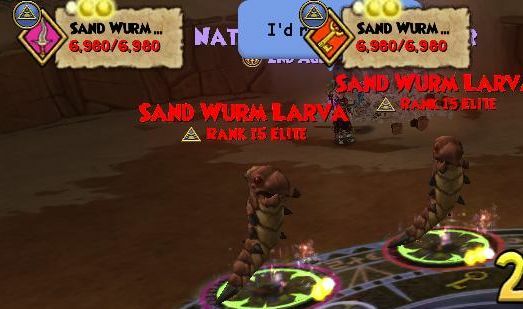 When you move on, there is another mob waiting for you in the second room: this time two Myth school Sand Wyrm Larva. These each have 6,980 hp and behave like a normal mob. 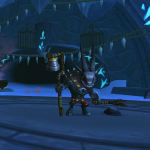 You can choose whether you want to battle these two alone, or do the puzzle first and fight them together with the boss then. Just walk around them and do the puzzle if you’re so inclined. It’s important that you don’t mess up this puzzle. If you do, you will have to battle another mob of Myth school Sand Wyrm Larvae. In fact, this mob will spawn every time you make a mistake in the puzzle, so you better get it right or you’re stuck in there forever. In this room, there are six pilars with a morse code sign written at the base of each. You should interact with the pilars in the order of the morse code found on the wall in the previous room. 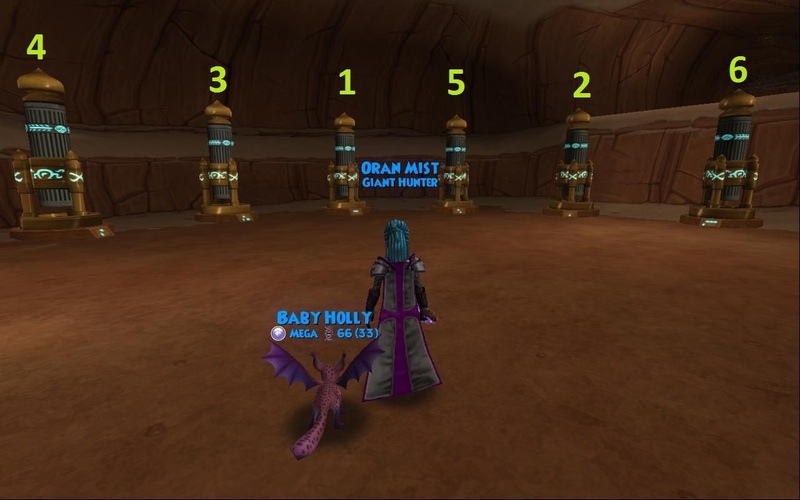 Finally, completing the puzzle will make the boss spawn. He’s called Melanj and only has 18,500 hp. However, he has several cheats to pay attention to. To start with, he will cast a -75% healing doom and gloom. If you try to replace this bubble, he will interrupt and recast it. When you blade, Melanj will interrupt with an attack that steals all your blades and leaves a -30% weakness on you. He will attack the person casting the blade, not the person receiving it, so it’s perfectly safe to blade your hitter, but the hitter shouldn’t blade themselves. When you cast a feint, Melanj won’t remove it, but he will interrupt to cast a plague that leaves a -45% weakness on every player. So if you plan on feinting, make sure you carry cleanse to get rid of your hitter’s weaknesses. Brand GhostSpear from the comments informed us of a cycle round cheat! Melanj says “spice strike”, and then casts the new Balance spell Sand Worm. Brand recommends balance dispels for this cheat. Don’t feint if you can’t cleanse the weakness.